The touchless trasch can has a senses when you are approaching. 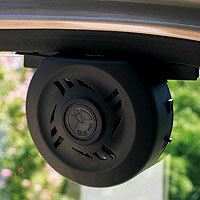 It will open and close automatically, allowing you to stay away from the germs in your trash can. (what, don't you ever clean out your trash can? Gross...). It's stainless steel and rated to open 100,000 times. No special bags needed, and a warning light goes on when the batteries begin to die (4 D). This keychain keeps up to 56 images on hand at all times. With a 1" screen, you can show off your favorite photos at any time and still put the photo away in your pocket making it easy to go. If you like to show off pictures of your kids, this is the gadget for you. The things you find on e-bay these days. 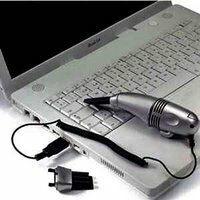 This is a mini vacumn cleaner for cleaning out your keyboard (and workspace). The best part is it's powered by a USB port, so you don't have to find a plug! Keep your car cool even when it's hot. I can't tell you how often I've gotten burned or blasted with heat when I open up my car door on a hot day. What a great idea. Although they are trying to sell this product by relating it to leaving kids and pets in cars, here's a public service announcement just for you. Never, never, never leave your kids or pets inside a car unattended, never mind on a hot day! "The AutoVent Turbo can spare you and your loved ones the blast furnace effect when you open your car door after it's been sitting in the sun; it keeps vehicles cooler by offering a secure, energy-efficient means of sucking out hot, stale air and allowing fresh air to come in. The AutoVent uses flexible weatherproof window strips that attach the Turbo unit to the top of the window, and combines safe, efficient solar power with a specially designed fan and housing. 12V car battery power cooling fan Solar powered cooling fan Fit windows from all models of automibiles Dimension of solar panel: 5" x 4.5" Weight: 1 1/2 LBs with built-in DC adaptor for cigarette light plug jack." How much fun is this? I used to love making a handprint out of these cool little pin toys when I was younger. 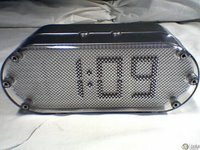 Pin clock: Patented mechanism drives pins to tell time in a 3D view and creates a bold display. An extremely unique and decorative conversation piece. Great for the bedroom, kitchen or living room. Move around your home at night without tripping or turning on the lights. 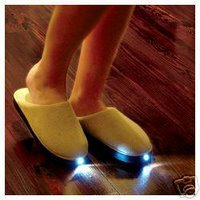 When you begin walking with these very comfortable slippers, the pressure of your toes turns the light on, if it is dark. They have a bright LED light in the toe that guides you to the refrigerator or the bathroom without stumbles or stubbed toes. The light sensor responds to dark conditions and is weight activated, so it will only illuminate when you need it, extending the battery life. These slippers are soft, cushioned terrycloth with non-skid soles. You can hand wash them. Powered by 2 lithium batteries (included) that are easy to replace. Beige color. Available in the following sizes. Select your size when ordering. Large that fit men's 11 - 12 and ladies' 11 - 13. eal present for comfort, safety and fun! This seems like fun to me. A pen that's also a radio. With such a small area to play with, it looks like you can only scan for stations. Who wouldn't want this? I think the IZ is just plain fun. Capable of playing music from your iPod or your stereo system, this is a great toy for kids. Twist his ears or push his belly to modulate the sounds. Kids will love his sound effects and his eye movements. I've seen them in red, green and blue. BTW, this is a toy for kids, so don't buy it as a cheap speaker for your iPod. You won't enjoy the results. Learn more about the RDS radio. Get a 5% discount on your firstSTREET order.